Making improvements stick and deliver value is not easy. This session is about how IT Managers can take advantage of proven Lean IT improvement practices to deliver quality to customers, identify waste and eliminate it, improve efficiency and the overall speed of execution. Learn how to improve your project success rate ! Improve your project success rate by leveraging Organizational Change best practices. Time and again our projects fall short of intended goals due resistance to change. Blaming the culture is valid but also a dangerous form of externalization. When we blame culture we make the problem so big it becomes un-actionable for a mere mortal IT professional. We absolve ourselves from even trying to fix the problem and resign ourselves to our sub-optimal project practices, grit our teeth, hope for the best and dream about other companies where people apparently magically embrace Agile, LEAN DevOps without resisting. Join this session as Paul challenges your thinking by presenting guidance taken from the ProSci organizational change management (OCM) best practice methodology. Come away with actionable guidance on how to integrate OCM principles into your projects to maximize adoption. Why you need to get in control now before it controls your destiny. What are the cloud technologies and management challenges that they present? Who is responsible for managing cloud services? What impact will this have on legacy IT service models? How do you harvest value without killing it? Where will you get the resources? This session is about updating your ITSM strategy and best practices to help the business manage cloud technologies. Understand the cloud components, how they fit together, governance mechanisms and underlying foundation required for successful IT Service Management. Learn about Lean ITSM tools used to make improvements quicker with less effort and with better results. Listen to real-world examples of how Lean ITSM tools were used to make a difference. - Better IT service delivery by reducing Muda (waste). - Prevent loss of customer loyalty by reducing Mura (variance). - Gain executive buy-in and commitment by creating better strategy & tactical plans. - Increase success using better change controls. - Reach end-of-job faster, with less resources and with better results. - Control outcomes by measuring, learning and adapting more quickly. This session is about how IT Managers used proven Lean ITSM tools to deliver and optimize quality to customers, identify waste and eliminate it, improve efficiency and the overall speed of execution of IT services. Listen to real-world examples of how Lean IT made a difference. •Better IT customer service desk by reducing Muda (waste) to improve incident flow. •IT prevents loss of major business customers by reducing Mura (variance) to improve customer services. •Service Desk managers develop strategy & tactics to free up executive resources by reducing time spent on major outages. See how Lean CSI methods, tools and techniques were used to overcome barriers to change. •Making improvements stick and deliver value is not easy. This session is to share how IT Managers used proven Lean IT improvement practices to deliver quality to customers, identify waste and eliminate it, improve efficiency and the overall speed of execution. Keith Vincent, Independent Consultant with Micromation Inc. This session is about updating your ITSM strategy and best practices to help the business manage disruptive technologies. Understand the components, how they fit together, governance mechanisms and underlying foundation required for successful implementation. 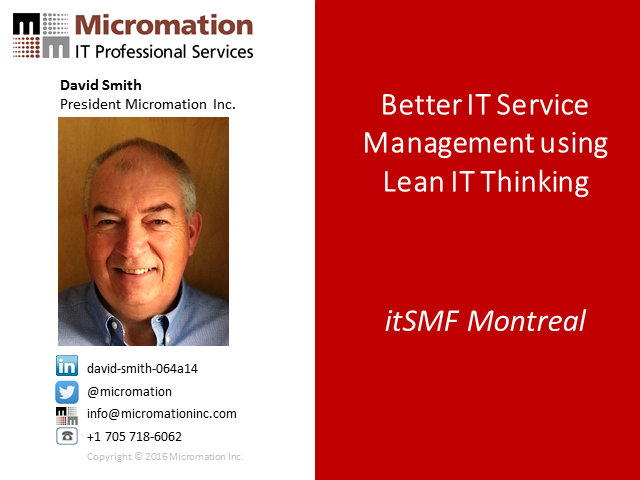 This session is about how IT Service Managers can take advantage of proven Lean IT improvement practices to deliver quality to customers, identify waste and eliminate it, improve efficiency and the overall speed of execution. Somethings broken? Customer’s not happy? This session is about how Incident Managers can take advantage of proven Lean IT improvement practices to deliver quality to customers, identify waste and eliminate it, improve efficiency and the overall speed of execution of Incident Management. Lean IT methods, tools and techniques to increase customer value. Lean IT helps improve quality to customers, identify waste and eliminate it, improve efficiency and effectiveness of services and products through continuous improvement.